Everything Beauty and Beyond! 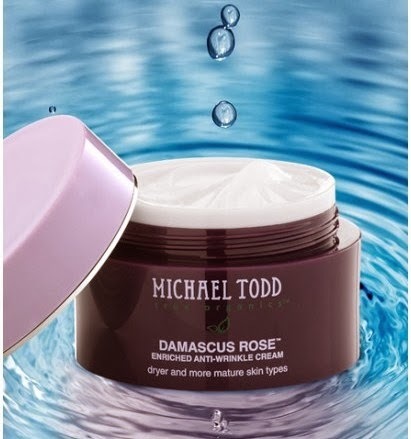 : Michael Todd True Organic Damascus Rose Moisturizer! Michael Todd True Organic Damascus Rose Moisturizer! When I first heard of Michael Todd True Organic line, it was through a groupon. I had never heard of this skincare line, but I saw this cream and for some reason really wanted to try it. I was in the market for a new one anyway, so I figured why not. I first googled the hell of out Michael Todd and found their website. However I wanted real people's review on these products and just about everything I read had nothing but awesome things to same about this line so I decided to go ahead and order the cream. It was originally on their website at that time for $130 (at that time) and I bought it through the groupon for $20. Sweet deal right! Even if the cream sucked, I figured $20 for a $130 cream; you really can't go wrong. SOLD! It took almost 3 months to arrive at my home. However when it finally did, I was so excited to use it that I could hardly wait. First thing I noticed was that it has a rosy smell to it and the cream is a yellowish based color. It comes in jar which is not the best for creams as air tight pumps are better but whatever. It is a decent size for a decent amount of product. Since it came during the middle of the day, I waited till night to use it. I washed my face as I normally do and applied it that night along with my skincare routine. I went to bed and woke up the next morning. My face felt refreshed, light and very well hydrated. I applied it again that morning after I washed my face along with my normal skincare routine and again my face felt awesome. This cream was light weight and not to greasy. It never clogged my pores, caused me breakouts or irritated my skin. I really left it feeling well moisturized and hydrated. By the time I laid my head on my pillow after applying my night time skincare products, this cream was the last part of my routine and it adsorbed well! Since a little goes a long way, it took about a year before the cream ran out and this was after applying it daily twice a day. Since this cream is very emollient all you need is one finger dab to go a long way....literally. All I did was dab one finger into the cream and that was enough to apply all over my face and neck. I was amazed on how soft and luxurious this cream was. However I did notice if you applied to much, it might feel to heavy on your face. So I would caution you use a small amount as that is all you really needed. I also noticed that if I rubbed it in or added extra cream into the dry spots on my face it hydrated that area well. It got rid of the flakiness and dryness around my face. It never left my skin feeling greasy and really left it with a vibrant look. MTTO Damascus Rose Moisturizer is formulated with 10 different peptides and tri-peptides which help with collagen production in the skin. Its combined with antioxidants such as A, B5, C, E and Co-Enzyme Q-10 which help to protect your skin from environmental stressors. It also includes essential oils such as Palm, Rose Hps, Avocado, Jojoba, Carrot Seed, Wheat Germ, and Neem which help to condition the skin and keep it soft and supple. My only complaint was the jar. Recently MTTO is slowly moving all their creams into air type pumps. It would be great if this followed suit! Air tight pumps reduce bacteria getting into the products as you no longer have to stick your finger into the cream. Furthermore air tight pumps reduce light and air exposure which tends to break down the formula in creams. So this would be great if this cream could be packaged differently in order to offer better quality to the consumers! I would recommend this cream if you have dry skin or mature skin and need to add a little extra punch into your skincare routine. I recently reviewed Michael Todd's True Organic Dry Skin Regimen. Click here if you want to check it out!